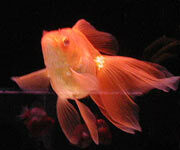 This is a superb fish with 100% self-colouration (i.e. 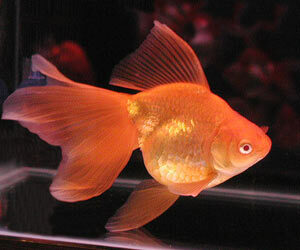 the single body colour extending right to the edges of the fins) and very unusual red eyes. A second such individual was seen in the same collection, more orange-yellow in colour rather than red. Notice the very slight trace of the ryukin dorsal hump (but one seldom seems to see a veiltail without this). Notice also the shorter, round-tipped paired fins compared with the longer, pointed-tipped paired fins of Western veiltails, and the slightly greater fork in the tail. 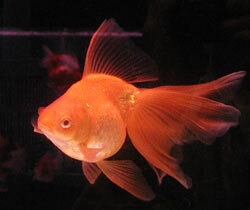 The fish has a good, upright dorsal fin (i.e. 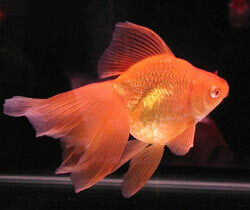 not drooping to one side) and relatively straight, uncurled pectoral fins. For their strength of body colouration, such fish would make a valuable outcross in attempting to recreate the pure self-coloured red metallic veiltails that seem to have been lost from the hobby in recent years. 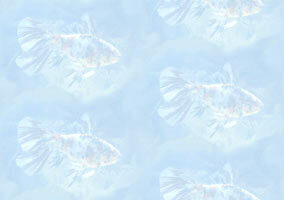 (Contact the Website Author for the source of these fish). 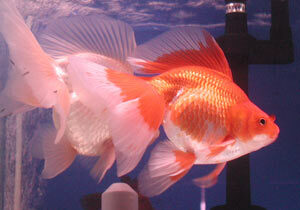 White metallic and red-white variegated metallic veiltails from a strain with shorter, more rounded paired fins than the red fish above. 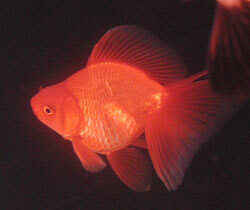 Very fine, deep red body colour in a young veiltail. The fins of this fish should lengthen with age.